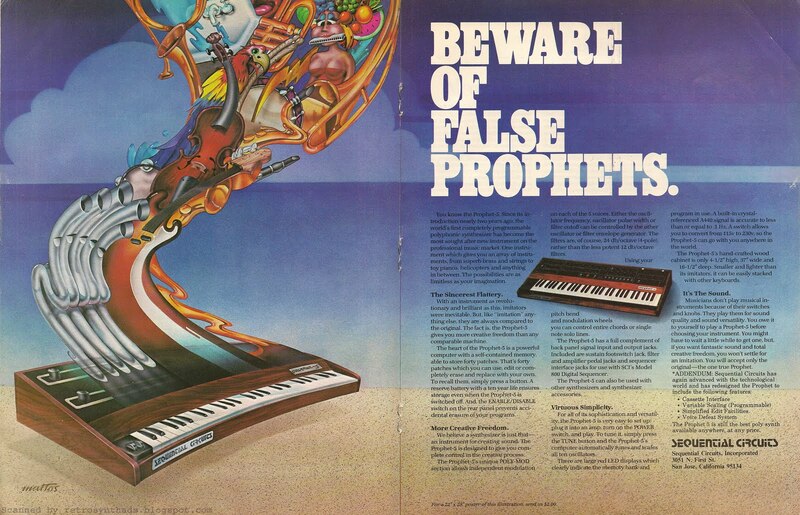 Sequential Circuits Inc. Prophet-5 two-page "Beware of False Prophets" advertisement from page 38 and 39 in Contemporary Keyboard Magazine September 1980. Holidays were great - thanks for asking! Got a good start on another project I'm working on, and also managed to get a great deal of napping in as well. Best of both worlds. But it is great to be back, and I thought I needed to start 2011 with a bang. And figured this was "a gooder". Although this ad isn't even close to being one of SCI's first for the Prophet-5, I believe it is another first for SCI - the first ad to include the distinctive artwork of John Mattos. And, even so early on in the Mattos/SCI relationship, the company new they had tapped something powerful. SCI even offered the image as a 22" x 28" poster for only two bucks! You can review some of my other SCI blog posts that featured ads with Mattos artwork, including these ads for the Pro-One, Prophet-5 and Prophet-10. Imagery aside, the title of the ad is also fantastic. With competition biting on the heals of SCI, what a great play on words - false prophets. Hee hee. This two-page ad actually first appeared once in the November 1979 issue of Contemporary Keyboard, and promptly disappeared. But then, out of nowhere after a ten month break, it ran again, just once, in the September 1980 issue. Both times, it was placed in the centerfold of the mag, so I would guess SCI wanted to be sure it was noticed both times. So, why the big break between ad-runs? I mean, two pages in the centerfold are probably gonna cost a fair amount. But SCI was running multiple ads in CK already and obviously had the cash. But, there had to be another reason. At first glance, there didn't seem to be anything different about the two versions of the ad. But, after closer inspection, two main differences in the layout were identified. The first difference is a minor one, but still historically relevant on some level or another (at least to me :o). In the 1979 ad, the address for SCI is listed as 3051 Orchard Parkway, San Jose, California 95134. In the 1980 ad, the road has changed to 3051 N. First St., San Jose, California 95134. Same ZIP code, Even same address number... just the road info has changed. Anyways, the second, and more significant change, provides a bit of insight into why SCI waited 10 months before running the ad again. That change is the addition of the "Addendum" paragraph right at the end of the ad-copy. In the original version of the ad, there is just blank space where the addendum ad-copy sits in this scan. But it's like the art director knew they needed some extra space for a later ad-run. And if that was the case... kudos to that forward thinking individual. Why the kudos? Well, turns out that the addendum paragraph was required for the 1980 version of the ad because in the time between the first and second run of the ad, Sequential updated the Prophet-5 from Rev. 2 to Rev. 3. Which makes sense - that Rev. 3 version included a lot of new features and SCI needed to come out with a bang. By using that original two-page colourful ad again, they saved a good deal of time and cost. It's a win-win for the company *and* the readers. Plus, they probably had a few extra posters lying around.